Director - International Centre of Neuromorphic Engineering (ICNS). André van Schaik received the M.Sc. degree in electrical engineering from the University of Twente, Enschede, The Netherlands, in 1990 and the Ph.D. degree in electrical engineering from the Swiss Federal Institute of Technology (EPFL), Lausanne, Switzerland, in 1998. He has authored more than 200 publications, invented more than 35 patents, and is a founder of three start-up companies: VAST Audio, Personal Audio, and Heard Systems. In 1998 he was a postdoctoral research fellow in the Department of Physiology at the University of Sydney, funded by fellowship from the Garnett Passe and Rodney Williams memorial foundation. In 1999 he became a Senior Lecturer in the School of Electrical and Information Engineering at the University of Sydney and promoted to Reader in 2004. In 2011 he became a research professor at Western Sydney University and leader of the Biomedical Engineering and Neuromorphic Systems (BENS) Research Program in the MARCS Institute for Brain, Behaviour, and development. In 2018, he became the Director of the International Centre of Neuromorphic Engineering. His research focuses on neuromorphic engineering and computational neuroscience. Neuromorphic Engineering is a sub-field of Electrical Engineering that aims to apply knowledge of how signals are processed in the brain to build electronic signal processing systems that vastly outperform current digital signal processing systems. Current 'smart' sensors are generally sensors with a built-in computer. ICNS aims to develop smart sensors with a built-in brain by combining bio-inspired sensors with bio-inspired signal processing. He is one of the pioneers of the field of Neuromorphic Engineering and a recognised world leader in neuromorphic vision sensors and audio sensors. The brain creates a coherent interpretation of the external world based on input from its senses. Yet data from the senses are unreliable and confused. How does the brain determine what is out there in the world around it? ICNS conducts neurophysiological and psychophysical investigations combined with theoretical, computational and electronic modelling studies to discover how the brain achieves this. The outcomes of the research will then be applied to create intelligent electronic senses. 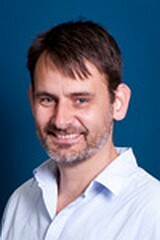 Director of the International Centre for Neuromorphic Systems (ICNS).